As the Web evolves and hundreds of sites collect data every day on who we are and what we love to do, personalization has become fundamental to user experience to help users find signal amidst the noise. Some companies utilize our social graph to provide recommendations from the people we trust, while others mine Big Data, incoming data from APIs and more. The problem, however, is that most recommendation engines focus on verticals — we go to Netflix for recommendations on movies, Pandora and Spotify for music, Yelp for food, GoodReads for books and so on — leading to fragmentation and a disappointing user experience. Frustrated with the lack of a holistic view when it comes to discovering things we love, Alex Elias and Jay Alger co-founded Qloo in the hopes of manufacturing a solution. 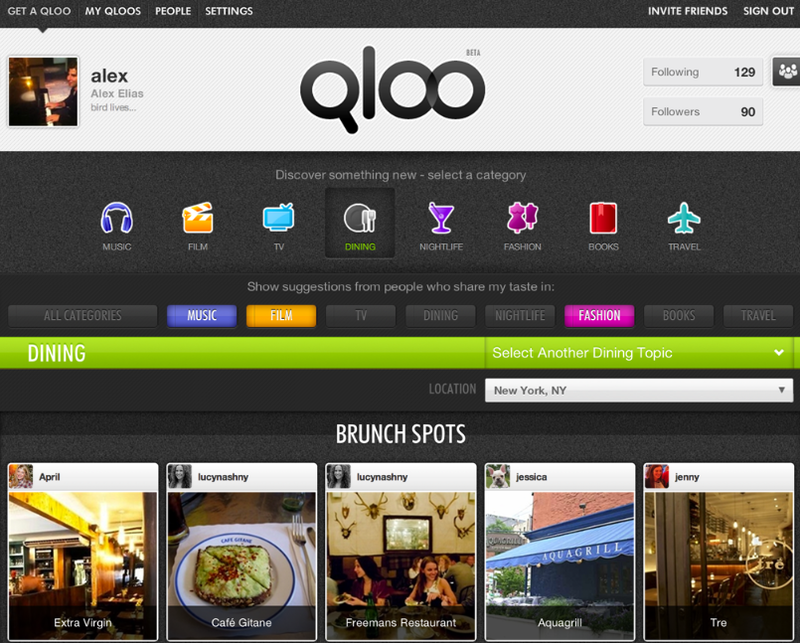 After six-odd months in private alpha, today the co-founders are officially launching Qloo to masses, offering users what they’re calling a “cultural discovery platform” that aims to provide personalized recommendations on music, film, TV, dining, nightlife, fashion, books and travel. 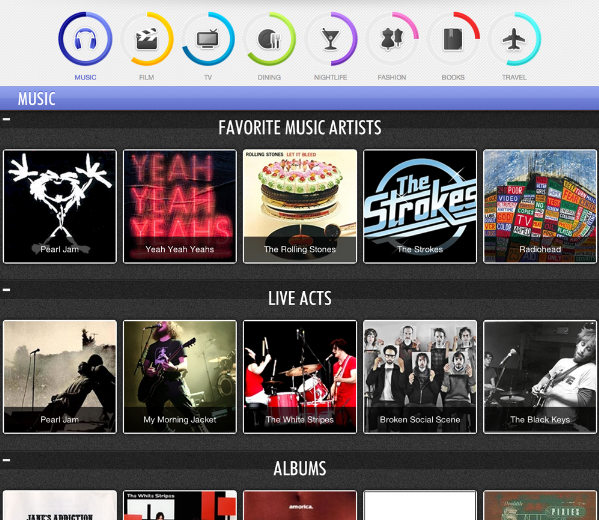 When users first sign up for Qloo, they’re asked to provide a favorite selection in each of the eight categories. From there, the site begins to build a horizontal taste profile, immediately serving recommendations in each category, allowing users to discover, say, a song they might love based on their penchant for hard-boiled detective novels. Qloo is an experiment of sorts and attempts to explore the relationship between what are usually disconnected cultural verticals — at least on the Web. But Elias (a former hedge fund manager) tells us that we’re all aware, even if subconsciously, that our tastes in certain areas inform our decisions and choices in others. Even if perfect correlations don’t always exist between what I read and what I like to eat, there are certain commonalities that can provide the foundations for some surprising and maybe even serendipitous discovery. One of my first questions to the founders was: But what about data? What about integrating Facebook data, Foursquare data, APIs and even Big Data to serve more accurate recommendations? The founders said that, although it may seem counter-intuitive, in trial runs they found that more data produced more noise, so they instead opted to let users control what they see and what verticals they connect. Users can parse the recommendations produced by Qloo, deciding which categories are most relevant when seeking those recommendations. In practice, this means you can use your preferences in each category to discover new music, or filter your music recommendations based on your tastes in film and nightlife, for example. Like Netflix, users can then up- or down-vote results, with the site taking that sentiment into consideration for future suggestions. Qloo also allows users to follow and view the taste profiles of others, adding a social context to the experience by allowing you to discover people with similar preferences. Hey, Steve has the same tastes in movies, books and restaurants, so I should follow him and check out what he’s listening to and what Qloo is recommending for him — or so Qloo hopes your thinking will go. Users also have the ability to add some depth to Qloo’s results by editing their taste keywords within each category, allowing you tinker away and add “smooth jazz” to your musical tastes, for example. While Qloo is focused on the breadth of its data rather than the depth (and will sink or swim based on how will it does this), the team has added geo-locational filters to two of its categories — nightlife and dining — so that users receive more informed recommendations based on where they live, or while they’re on the go. And to that point, clearly mobile is going to be important to Qloo’s value proposition, especially for those two categories. Location-based recommendations are currently available for New York City and Los Angeles, but the Qloo founders say they’ll be rolling out additional cities over the course of the year. A mobile web app is also in the works and should be available in the next few weeks, Elias said, with native iOS and Android apps to follow in the coming months. To help get the business off the ground, Qloo has raised $1.4 million in seed funding from Kindler Capital as well as a few notable TV and media personalities, including Cedric The Entertainer and Danny Masterson. While Qloo is now open to the public (for free), the platform is still invite-only and will likely remain somewhat closed for the next few months. 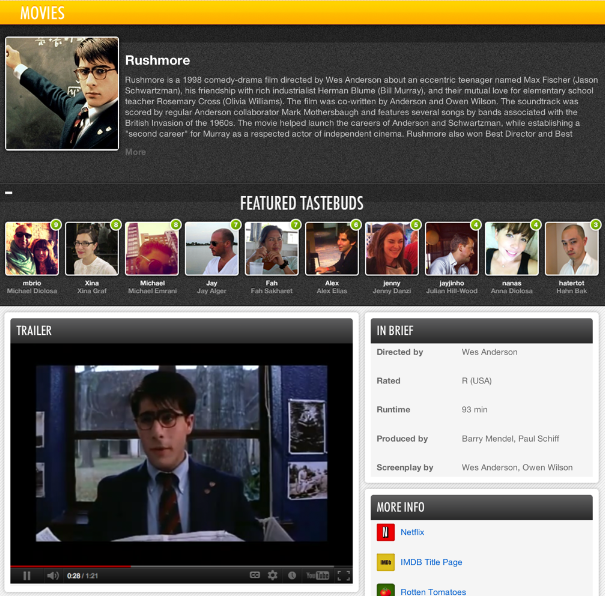 For another take on the “recommendation engine for everything,” check out Tipflare.